When this spell comes into play, select 2 dice in your exhausted pool and place them into your active pool on a side of your choice. When you play this spell, place it face up under a ready spell on your spellboard. 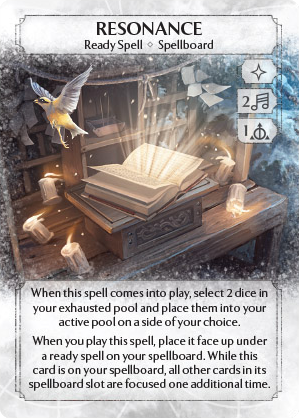 While this card is on your spellboard, all other cards in its spellboard slot are focused one additional time.